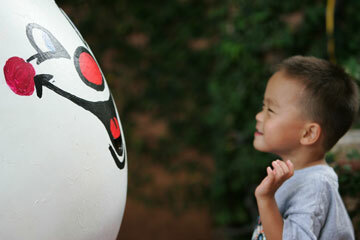 Mason Maeda, 4, smiled while chatting to Humpty Dumpty yesterday afternoon at the Children's Fair at La Pietra School for Girls. This year's theme was "Around the World," and activities included digging for King Tut's treasure, a Tiki Toss, a petting zoo, pony rides and other games. 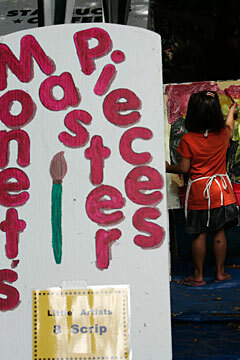 3-year-old Molly Palalay busily painted her own masterpiece. 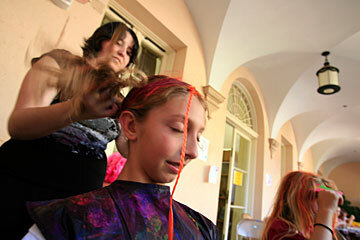 Jaimie Edge, at near left, got her hair colored and styled by La Pietra senior Lindsay Fox yesterday afternoon during the Children's Fair at La Pietra.